We are now hosting open build nights on the 2nd, 3rd, and 4th Wednesdays of the month at 7 PM. These nights are open to members and non-members so if you're interested in checking out the space, come on by. Bring a project you'd like to work on, meet others who have the same passion or can help out, and/or work on one of our Decatur Maker projects du jour. This is for makers of all ages, skill sets, and interests. Stop by, stay hi, and stay for the making. Full STEAM Ahead is formatted to spark the imagination of children by providing innovative, hands-on programs that are Science, Technology, Engineering, Arts, and Math (STEAM) focused. Registration is required. Limited to 20. Intended for ages 9 and up. Join artist, Bekalyn Craig, for an exciting exploration of the world of art. Part of the Gritters Library’s Preschool Wednesday Early Learning series, this program is designed to help kids ages 3-5 years and their adult caregivers, learn about art through history and science. Each class explores an art medium and includes a craft and activities! From the origami that is launched into space to T-Rex watermelons, we can go where no other children’s art class has gone before. Where does a pencil come from? Who invented paper? Find out more at Kid Art Smart! Family build night is geared towards our littlest makers, age 6-10 and their adults. All projects supplies are free. But donations are welcome. This is a drop-in event. Come for the whole time or just a bit. Bring your dinner and hang out if that helps you get here! 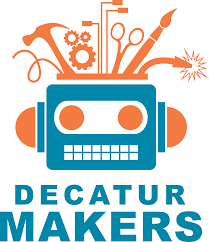 Parents/Guardians must stay at Decatur Makers with their kiddos. It is FAMILY Build night after all. Join The Nature Club monthly potluck and mingle with folks with similar interests. Then join our speaker at 7:30. The Nature Club meets the 4th Thursday of each month January to October. Themes vary each month. COST: $10 general public/$5 CNC members. Join us for an introduction to the GarageBand interface, working in track view vs. Live Loops and setting up your song or podcast. Learn recording for the beginning Podcaster casual or non-musician. For more information, e-mail [email protected]ntyga.gov or call 404-613-5771. Come explore different activities using science, technology. engineering, art and math. Join Mr. Jeff as he leads us in our every other month exploration into the stars and galaxy above. Ages 5+ with a parent or caregiver. Join Mr. Jeff as he leads us in our every other month exploration into the galaxy and stars. Solar System Ambassador Ginny Mauldin-Kinney will discuss the Mars Insight Lander, the Curiosity rover, Chinese recent lunar landing, New Horizons in the Kuiper Belt, and other scheduled missions. Our monthly meetings are free and open to the public. Please join us! Free parking is readily available to the south of the building. Food and drinks are available for purchase. Topics and activities vary each month. Check the website for my details. A one-hour introduction to computer science, designed to demystify “code” and to show that anybody can learn the basics.